Cool Hollow House, a private residence, was built c.1823 by the very prominent Emmert family. The Emmert family founded the Church of the Brethren in Washington County, and were early pioneers that helped to settle the area. Progressives for their time, local lore has it that a large tree that once adorned the front lawn was a marker along the Underground Railroad, establishing safe haven at the Emmert home. Always an elegant property, former owners include prominent 19th century merchants and farmers, a jeweler, a prominent engineer, and a well know children’s author and illustrator. The house boasts fifteen rooms, retaining almost all of their historic character. The grounds are inhabited by venerable trees, some more than two centuries old, a coy pond with waterfall, historic mill ruins, and an 18th century stone forge. Residing along the banks of the historic Antietam Creek, the property includes both the east and west banks, providing gorgeous sunset views along the water, and ample privacy. The tracts of land on which Cool Hollow House resides date back to the early division of the area, starting in 1732 by Charles Calvert, 5th Lord Baltimore. The Macklefish, and Chaney families first owned the area that encompassed the property during the Colonial era. These Colonial patents were “Macklefish’s Ridge” c.1738, “Chaney’s Delight c.1738, “Strife” c.1740, “Cadiz” c.1759, “Chaney’s Chance” c.1762, and “Stull’s Forest” c.1761. Proving the importance of this location along the Turnpike Road, is provided by the fact that only 16 ofthe more than 2250 patents issued in Western Maryland between 1730 and 1830, predate the patents of “Macklefish’s Ridge”, and “Chaney’s Delight”. The property sits on a prominent curve along the National Road between Boonsboro and Hagerstown known infamously as “Death Curve”. Previously known as the Boonsboro and Hagerstown Turnpike and Bank Road, the road was one of Maryland’s through routes during the early 18th Century in Maryland. 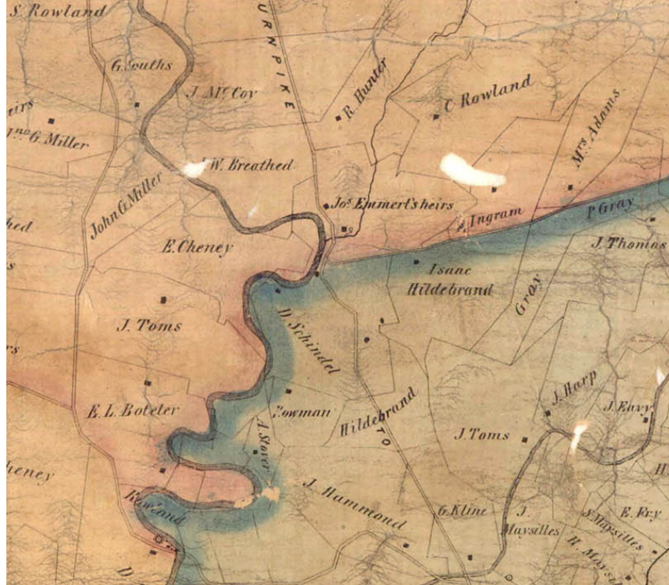 Both the 1780, and 1794 maps of Maryland also show the route in existence. This proves that the route along which the nominated property sits has in fact been an important thoroughfare for at least 260 years. This road, a part of which rests on the nominated property was already well-travelled by 1760, this predates the birth of our nation by more than two decades. The farm grew even larger as it was assembled by Matthias Springer by purchasing pieces of the aforementioned tracts between the years of 1793 and 1802. Matthias Springer and family lived on the property in 1798 when other prominent land owners of the time such as John Booth, John Shafer, and John Clagett, published a statement in the Elizabeth-Town Adviser. “We the subscribers, living on the waters of the Antietam, in Washington County, holding land there on, find that very great inconveniences arise from sundry persons fishing in that creek- We therefore give public notice, that after the date hereof, we will not allow any person of persons to fish therein, unless liberty be first obtained. Those who disregard this notice, will be dealt with according to the law. John Booth, Elijah Cheney, George Powell, John Shafer, Jeremiah Chaney, Nich. Broadstone, Matthias Springer, Nich. Frankhauser, John Smith, Joseph Chaney, Stephen Follen, Edward Breathed, Elizabeth South, Christian Bnckly, Jacob Sharer, John Clagett. Washington County, August 16, 1798.” The 1803 tax records for Washington County put the value of the then deceased Matthias Springer’s “Macklefish’s Ridge” farm, which included 2 stills, at 311 Pounds and 18 shillings making him one of the wealthier men in the Jerusalem Hundred. The household furnishings, etc were valued at 124 pounds, quite a handsome sum. This does lead one to assume at that point there was a substantial dwelling of size already in existence. Again it is felt that the current home was constructed on the foundations built by the Macklefish’s in the 18th century. Springer’s heirs sold the farm of 180 acres in 1809 to Benjamin Emmert for about three thousand pounds sterling. This converts to about $250,000 today, which for a property in the still developing frontier was quite a bit, proving that it was already at that time, a farm that had been well developed. Deed T/478 does state that the land and premises are included. Benjamin Emmert had the land re-surveyed on September 5, 1821, and named the new patent “Emmert’s Home”. Curiously enough, the name of the patent, “Emmert’s Home”, tells a story in itself. After owning the property for over a decade, and himself nearly 50 years old, it is almost certain that the Emmert’s had constructed the current large brick dwelling by that time, and the new patent was in honor of it. Several early newspaper articles show Benjamin Emmert living at the location of the current house on the Turnpike road. The first is an 1819 reference to the construction of Cool Hollow Road, linking Route 40 to Alt. Route 40. The second reference just five years later in 1824 mentions the construction of the “Tollgate House” (WA-II-177), next to Mr. Emmert’s which sits just north of Cool Hollow House on the Old National Pike. These references provide fact that Benjamin Emmert, a man of considerable wealth, and son of Leonard Emmert, the man who founded the Dunker Church in Washington County, had built a home of some stature along the newly constructed Turnpike Road. The dates of 1819, and 1824 are congruent with the style, and construction methods used to build Cool Hollow House. Around 1810, the Potomac Company proposed to build a series of “Lock Gates and other works” along the Antietam to facilitate bringing the many goods manufactured along its banks to the Potomac, and thus to major trading locations. Benjamin Emmert built a dam prior to 1814 on the property after the effort had begun, and proposed a canal as well to circumvent “Chaney’s Falls”, a series of steep rapids in the creek at his property. Ruins of this damn can be seen fording the creek. The 1810, 1820, and 1830 Federal Census show Benjamin Emmert living on the property in district 6 where Cool Hollow House resides with a large household. Mr. Emmert purchased a small tract of land from Elias Cheney, son of Ezekiel Chaney on the west bank of the Antietam directly across from where the house sits in 1838. This tract includes an 18th century mill site. It is unclear at this time if Benjamin Emmert used the mill site during his ownership. The year 1831 brought much sadness to the Emmert home. Yost Harbaugh, the decorated Revolutionary War hero, and father to Benjamin’s wife Anna Maria Harbaugh contracted Asiatic cholera and passed away while staying at the house. Within one month of her father’s death Anna had also succumb to the disease along with their young son John. By the year 1848, Benjamin had lost his wife and all of his children except his daughter Magdalene. Magdalene Emmert married David Schindel in 1843. Benjamin Emmert died in 1851, leaving the majority of his vast estate of nearly $90,000 ($3 million today) to his sole surviving child, Magdalene and his grandchildren. Upon the death of Benjamin Emmert, “Emmert’s Home” was sold to Philip Schindel, father of his son-in-law David Schindel for $14,500, proving that at that time the property had substantial improvements. Philip in turn sold the property to David and Magdalene in 1856, ensuring the farm stayed in the Emmert family. The 1850 census does show them on the property in district 6, with their land value at $19,000, while Phillip Schindel resided in Fairplay. This was a considerable sum for such a young couple, more than half a million dollars in today’s currency. Benjamin Emmert also owned the famed Roxbury Mill (WA-II-134), which was one of the largest distilleries of its day and dates to the 18th century. According to the extensive wills of Benjamin Emmert, considerable money was owed to him for the crop of wheat and rye, the materials used to make whiskey. (will citation) Emmert farmed these crops on the nominated property, and would transport the goods to Roxbury. Roxbury Mill was less than a mile downstream from “Emmert’s Home/Cool Hollow House”, and a minor road shown on old maps links the property to it running along the west bank of the Antietam Creek via a fording place on the property. 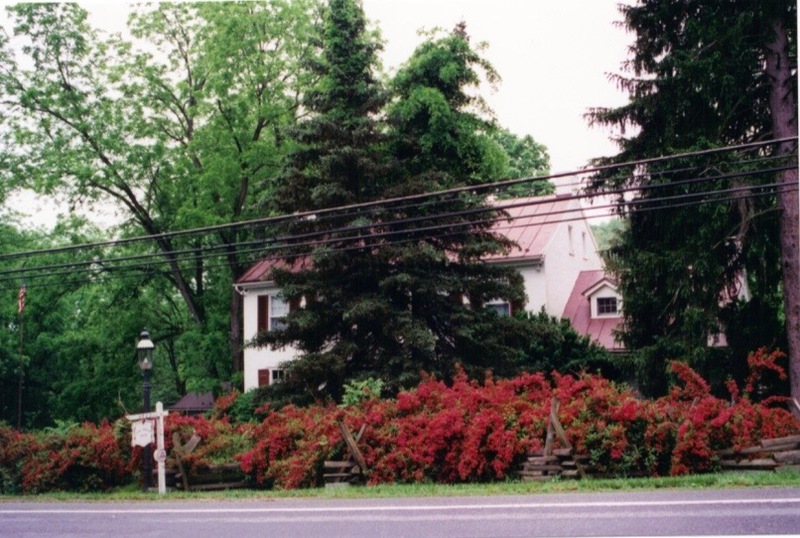 While the mill itself was sold to the Rowland family in 1851, David and Magdalene became owners of the extensive acreage around it after Benjamin’s death. The prosperity of David Schindel and his wife Magdalene grew considerably in the next few years. By 1860, David and Magdalene Schindel’s “Cool Hollow” was listed on the census as being valued at $35,000 dollars, over one million today, making it one of the more valuable farms in the county. David Schindel was listed as a farmer. The Schindel’s also owned a lumber business and “valuable land” on South Mountain with “virgin timber” purchased from David’s father Philip Schindel in 1856. Three generations of the prominent Benjamin Emmert family would own the property from 1809-1910, over a century. The United States Civil War was arguably the most violent and divisive time in our nation’s history. Cool Hollow House witnessed this first hand during the days of July 8-10, 1863 as General Robert E. Lee retreated from their defeat at Gettysburg. As Lee prepared to ford the Potomac River at Williamsport, MD just a few miles to the west, the swollen river provided a challenge. The construction of new means of crossing would require several days. Lee instructed his Generals to set up a line of defense stretching several miles from Williamsport past Funkstown. Union and Confederate forces would battle many times over the next days, mainly along the National Road between Funkstown and Boonsboro. Grumble Jones’s brigade led the way, attacking the Federals on the Boonsboro Turnpike at Beaver Creek Bridge, just south of the southern border of the Schindel property. The Confederate army pushed the Yankee videttes back to the edge of the village of Boonsboro. Jones took a few prisoners, who informed him that the bulk of the Federal cavalry had massed at Boonsboro. The furious advance by the Confederate’s cavalry led the Union army to believe Stuart’s mission was to seize the South Mountain gaps. If the South could take and hold this pass, he could bring Meade’s pursuit of Lee to a grinding halt. The Confederate army led by J. E. B. Stuart marched past the house continuously that day both morning and night. The Confederates, retiring from the Battle of Boonsboro, made camp on the ridges and farm fields of the Schindel’s Cool Hollow. The location was strategic for its location on the Antietam Creek, overlooking the narrow pass on the National Road. July 9th provided more excitement at Cool Hollow House, as the tension continued to escalate between the two opposing sides. The Union forces led by General John Buford pressed north from Boonsboro to Funkstown along the National Road towards the Confederate line causing continual skirmishes throughout the day around the house. In the late afternoon Buford ordered Devin to scout out the location of the Confederate’s who had been camping around Cool Hollow House north of Beaver Creek Bridge. Devin’s cavalry intercepted the Confederate forces including artillery as they entered the hollow. Southern forces placed on high ground above the road, and overlooking the house and Antietam, fired upon the Federal forces in earnest, boxing in the infantry behind a rail fence near the farm buildings on the left side of the road along the creek. Several casualties ensued as the federals endured the heavy fire from the guns of Chambliss and Jackson. Federal cannon soon arrived and a large gunfight thundered around the property. After gaining the upper hand, Confederates forced the Federal troops back south down the turnpike, and across Beaver Creek. As July 10th, 1863 dawned, the air was very humid and hot. A light drizzle would fall upon the rich fields. Early in the morning General Stuart was alerted of a large Union force working its way toward Funkstown, via the National Road. General John Buford and his cavalry division once again crossed Beaver Creek Bridge and pressed north to Cool Hollow. Another skirmish ensued at the place where the Antietam Creek unites with the National Pike three miles from Funkstown, on the nominated property. Fighting began in earnest as once again Devin and Merritt’s brigades intercepted the Confederate forces. The Federal troops were well prepared this time, and drove the Southern troops back toward Funkstown, three miles behind them. In the years after the Civil War, Cool Hollow House was sold to David and Magdalene Schindel’s son Benjamin and his wife Julia in 1878 for a sum of $12,000. Benjamin Schindel was the owner of the Schindel-Rohrer Company at 24-28 South Potomac Street in Hagerstown, MD. The building Benjamin Schindel built at 28 South Potomac Street for his business in 1918 is listed on both the Maryland Inventory of Historic Properties, and the National Register of Historic Places as the National Register Hagerstown Commercial Core Historic District. Over the next century while it shrank in acreage due to several subdivisions of the old patents, Cool Hollow House was extremely fortunate to have had many responsible stewards. By the 1950’s the property was at its current 6.92 acres. In the late 1970’s the notable author and illustrator of children’s books Julia Nordell owned and lived at the property. Cool Hollow House stands as a fine, restrained example of early 19th century Federal/Greek Revival architecture in Mid-Maryland. Built by one of the most prominent and influential families of this part of the state. The property remains largely unchanged since its construction nearly 200 years ago. Beyond the architecture, the house proudly guards over land that played host to some of the most important pieces of our nation’s history, the westward expansion, early manufacturing, and the Civil War.